Vespri Siciliani presents a deliciously fresh take on true authentic Italian cuisine in Boca Raton. 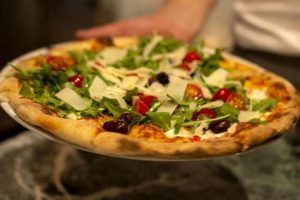 Located within Royal Palm Place, Vespri Siciliani now serves hand tossed, sicilian wood-fired pizza made with our homemade pizza dough. Pizza lovers will be guaranteed to find something they love on our roster of over 20 wood-fire creations, including Pizza Italia, made with fresh tomato sauce, fresh mozzarella, arugula, cherry tomato, bufala DOP and prosciutto di parma, Pizza Rustica, made with fresh tomato sauce, fresh mozzarella, roasted potatoes, rosemary, pancetta and Pizza Capricciosa, made with fresh tomato sauce, fresh mozzarella, artichokes, black olives, ham, and mushrooms. Our wood-burning oven operates at a much higher temperature than any other traditional kitchen oven and the high cooking temperature of the brick oven in combination with the wood burning fire creates a crispy, golden brown crust with a subtle smoky flavor. The cheese is melted and bubbling, the toppings remain crisp and the crust has the perfect combination of chewy on top and crispy on the bottom. When these textures and flavors come together, it truly sets our pizza apart from the rest!